When time travel is invented, I will return to the past with advice for myself the moment before I learned to sew. 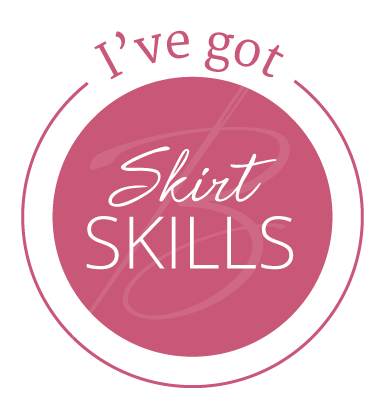 I will tell me to build up my skills sewing dartless tops and skirts with elastic waistbands (that will become inevitable and welcomed after having children). I will also warn me about the horror of sewing machine needle piercing pinky finger. Darts on the full-busted are ridiculously huge. There’s this Pac-Man wedge of fabric that’s supposed to shape my curves but it sews up bulky and pointy unless I get all couture-y (which I rarely have patience for). Strangely, I had enough patience to learn dart rotation so I can disappear the damn things altogether. Back in the day, I first sewed this basic tank pattern into the Devil Wears Floral Top and made plans to change it up with neckline gathers. Fast forward to now. I grab my beat up copy of Patternmaking for Fashion Design to learn the basics of dart rotation. Then, a little googling leads me to this tutorial which hooks me up with a step-by-step lesson on rotating a side bust dart into the neckline to create gathers. The EXACT thing I was trying to do with my pattern. This is the result, tested out as a crop top (in attempt not to waste the fabric if my experiment failed) in polka-dotted rayon challis. The whole procedure feels like sorcery until you sew it up and your mind is like, “Oh, that’s all it is!” The one thing I didn’t anticipate was having to abandon my usual 1/2″ bias tape facing application for a more suitable visible binding. The linen bias binding is leftover from the Driving Men Mad Dress, but the next time I sew this top (likely as a dress), I’ll make bias binding from matching fabric. Right up there with dartless tops are elastic waistbands on skirts. And, the holy grail of elastic waistbands is the extra wide elastic waistband that is sewn right to the fabric in no time flat and worn on the outside for all to see. My go-to dirndle pattern with pockets was sewn in a flowy print to 3″ stretch elastic from my stash. I love how the wide elastic makes the gathers less bulky. Ignoring that it needs to be hemmed shorter (midi length isn’t the best on me) and that this elastic is too awesome to have ever spent time as “stash”, I am liking this situation and will certainly repeat it. Say hello to the Waist No Time Skirt. I am glad to report that after sitting at a desk most of the day and chasing a one year old around in the evening, the elastic held up nicely. No weird creases or rolling about. Perfect for those days when someone suggests the Indian buffet for lunch. As for my time travelling plans, I don’t think I’ll risk the effects to the timeline just for selfish sewing advice. Maybe for selfish celebrity meet-cutes with Idris Elba, instead. What about you? What might you travel back in time to say to your younger self about sewing or fashion? This entry was posted in Design Notes, Somethings Sewn, Uncategorized. Bookmark the permalink. I stumbled upon your blog just now (via a search for square tops, I believe) and have been reading up a bit. I think you have a lovely attitude towards blogging, sewing and yourself and it’s very inspiring. I’m just tarting to teach myself how to sew my own clothes (the ready-to-wear ones seldom fit – especially pants – and if they do, they’re too expensive) and I love to learn how to make stuff myself. So thanks for the encouragement! Wishing you a great weekend. Thanks for the comment, Camilla. I hope telling my stories encourages folks to sew.